The Ferrari F60 America is effectively an open-top version of the insane F12. 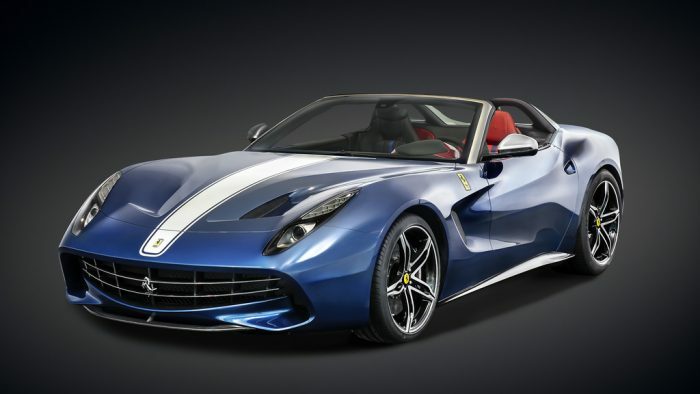 The F60 America – named in celebration of Ferrari marking six decades of selling cars in the USA – trades in the F12’s hardtop for a lightweight fabric roof useable at speeds of up to 80mph. But the F60 America is actually rather more than just a de-roofed F12. There’s fresh aluminum bodywork, too, with deeper side strakes, extra bonnet holes and more pronounced winglets. the F60 America will be limited to a production run of just 10 units. All have been spoken for, and though Ferrari’s giving no hint on price, you can safely assume it to fall into the ‘eye-watering’ category.